Bay View Bach is a self contained one bedroom flat in the garden of our house in the historic town of Maketu. It has panoramic views of the Bay of Plenty - from the Papamoa Hills and Mount Maunganui to the Kaimai and Coromandel Ranges. Recently extensively refurbished it provides comfortable accommodation within walking distance of two stunning Pohutakawa lined beaches and is minutes from some of the best attractions in North Island (25 minutes to Mount Maunganui and 40 minutes to Rotorua and Whakatane). There is a queen-sized bed, plus a large comfortable sofa bed. The kitchen has a cooker with oven and hob, a microwave, fridge-freezer and toaster. The sitting room has a table that seats four, freeview tv, cd player with radio, Bluetooth and free Wi-fi. The bedroom has a TV with DVD and USB player. On the deck you can sit and take in the wonderful sunsets. Things to do in Maketu include swimming, walking, bird watching, boating, diving, windsurfing, surfing, fishing, kayaking and relaxation. Bach within the grounds of the owners residence and is predominantly set up for couples, but king size sofa bed (1 x king size bed or 2 x king single beds) in lounge for additional guests. Highchair can be provided, but guests would need to BYO port-a-cot or similar. Completely fenced section, safe for children. Security cameras for safe parking. Our family lives on the property where your separate accommodation awaits. Jen is a small animal veterinarian that works in Te Puke. Dave was a large animal veterinarian who has since resigned to care for our toddler, Ella. Abby is a 6 year old Labrador who is super friendly. 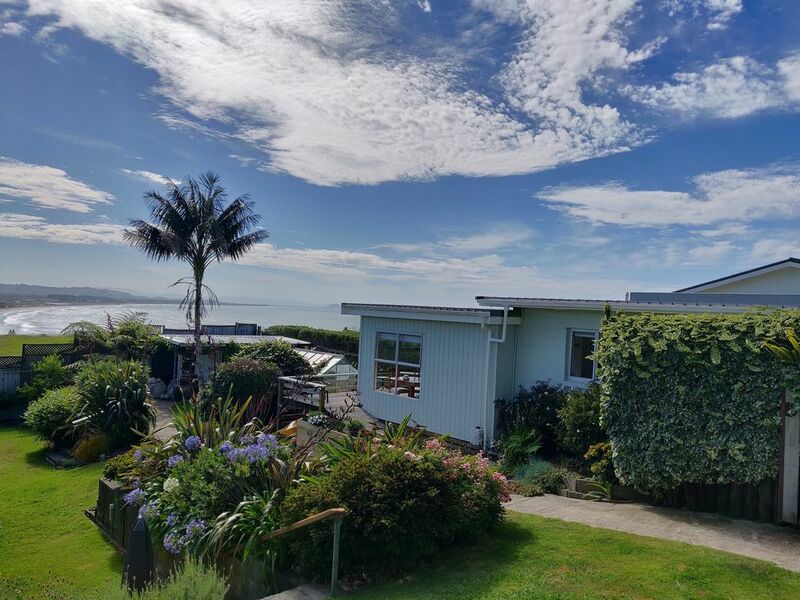 Our family brought this property for the beautiful ocean, beach and estuary views, proximity to the beach, relaxed rural feel and scenic gardens. We hope you enjoy it as much as we do. Located in the owners garage. Access for guests through pin code door. Off street parking, guests can use right hand side of driveway, in front of wooden gate. Dining table seats four + highchair (when necessary). Seating for 5 to 6 people (not including dining table seats). Coffee, tea, sugar, milk provided. We also provide a free amount of locally sourced plunger coffee and a coffee plunger. Plunger coffee sourced from NZ Cafe of the Year 2018. Dining table extends with folding wings. The place itself is has everything you need. Queen bed is firm and very comfortable. My son slept on the fold out bed in the lounge and said it was fine. The automatic ice maker in the fridge was handy and kept us well stocked. Is about 30 minutes from everywhere which was what we were looking for. Easy access to Tauranga and Matamata (Hobbiton). as well as nice coastal drives and towns to the south. Super fast and efficient communication. Dave was great and made sure we had everything we needed and was keen to help out where ever he could. Had lemons from the tree to go with our fish. I had left my camera charger there by accident when we departed and Dave was quick to let me know and then mailed it to me that day. Thanks for that Dave! Both the property and the owners come highly recommended from us. The house was very clean and nicely furnished. Very nice bathroom. The house was not that big ( perfect for 2 people) but it was very space efficient with a lot of clever solutions so it worked really well for us (a family of five) to stay there. Beautiful garden. Friendly and very helpful owners. Very nice property and location close to everything. Very nice property and location close to everything. Nice private location that is fully equipped with everything you need. So peaceful as well. Great property. Close to everything. Very clean. Everything you need. Quiet. And great views.